With one swing of the bat Los Angeles Dodgers left fielder and 1988 National League MVP Kirk Gibson turned the World Series fortunes of the underdog Dodgers, connecting off Oakland A’s Cy Young award-winning reliever Dennis Eckersley for a walk-off, two-run homer to give the Dodgers a come from behind win in the Series’ first game. Gibson’s epic seven-minute, pinch-hit, at-bat was made all the more improbable by the fact that he was hobbling on two injured legs and barely able to walk at the time. Gibson looked overmatched when he fouled off the first pitch and had trouble getting out of the batter box when he hit another foul ball nubber down the first base line. 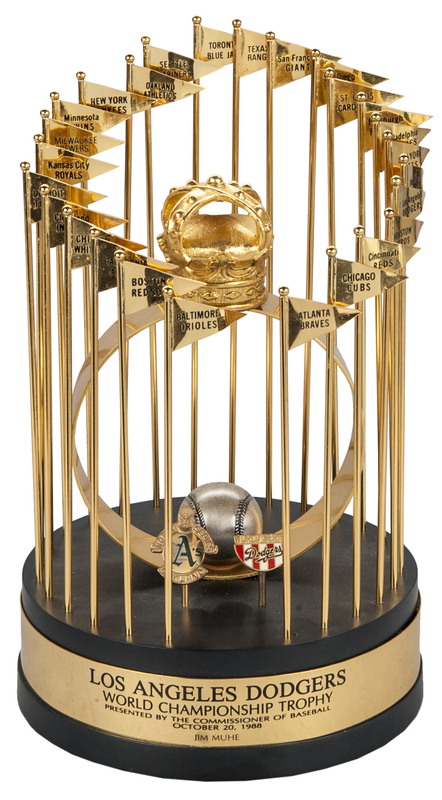 After working the count full, Gibson reached down and lofted the eighth pitch of the at-bat into the right field seats and slowly limped his way around the bases for one of the most memorable home run trots in history. 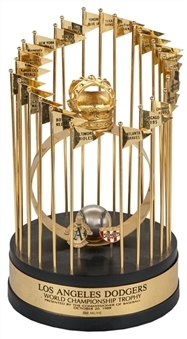 Suddenly the heavily favored Oakland As didn’t look so unbeatable anymore. 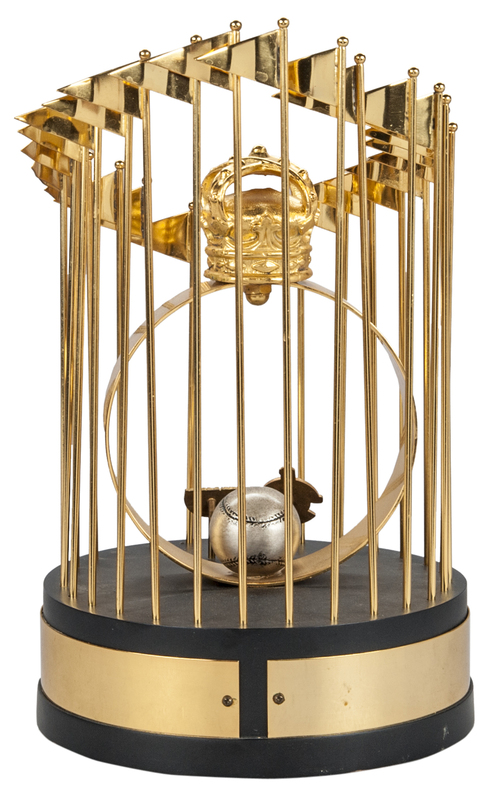 The Dodgers glided to a four games to one series victory and NL Cy Young award winner Orel Hershiser was named Series MVP. 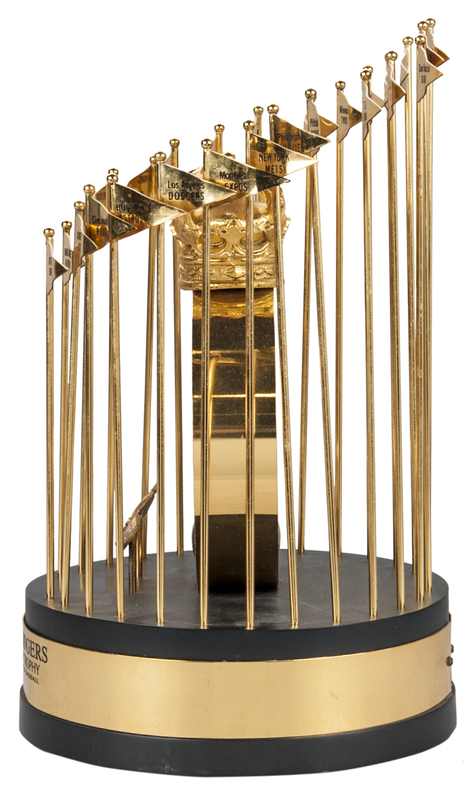 It was a magical season for the Dodgers and both Gibson and Hershiser’s names are forever etched in the team’s lore. From August 30th to September 28 Hershiser threw 59 consecutive scoreless innings breaking former Dodger Don Drysdale’s record. 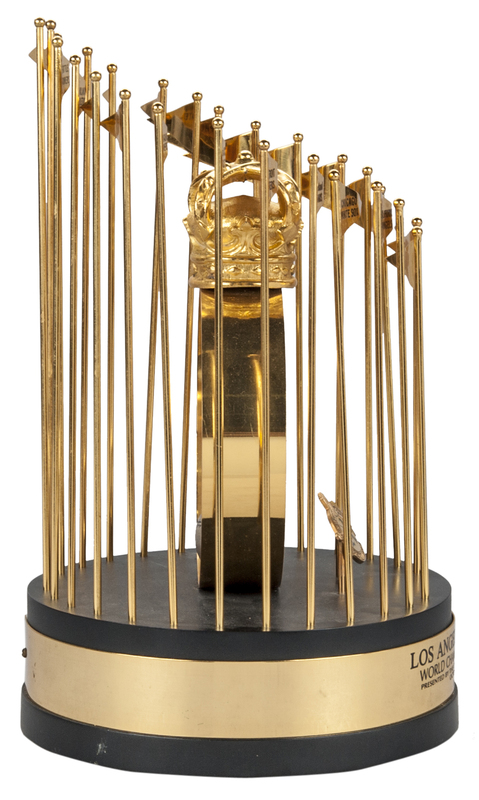 This 12” tall scale model replica of the Commissioner’s [World Series] Trophy created by the Balfour sports industry jewelers and was given to Dodger’s visiting clubhouse manager Jim Muhe. 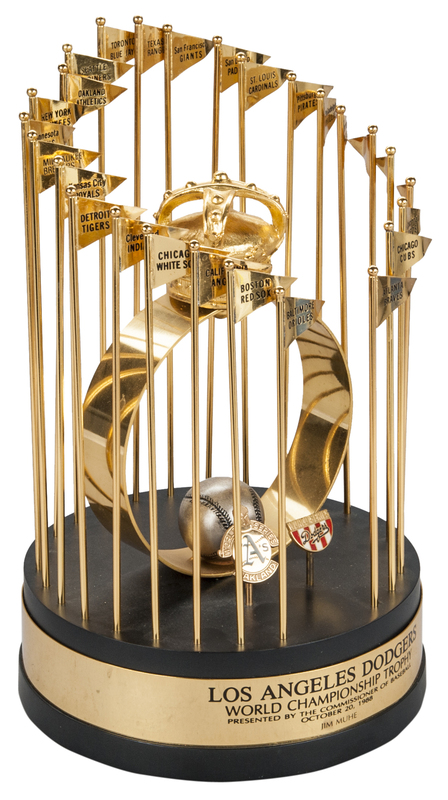 The classic design features 28 gold colored pennants labeled with the names of every Major League team circling a golden crown on top of a golden band with a silver baseball set at the base of the ring’s interior. 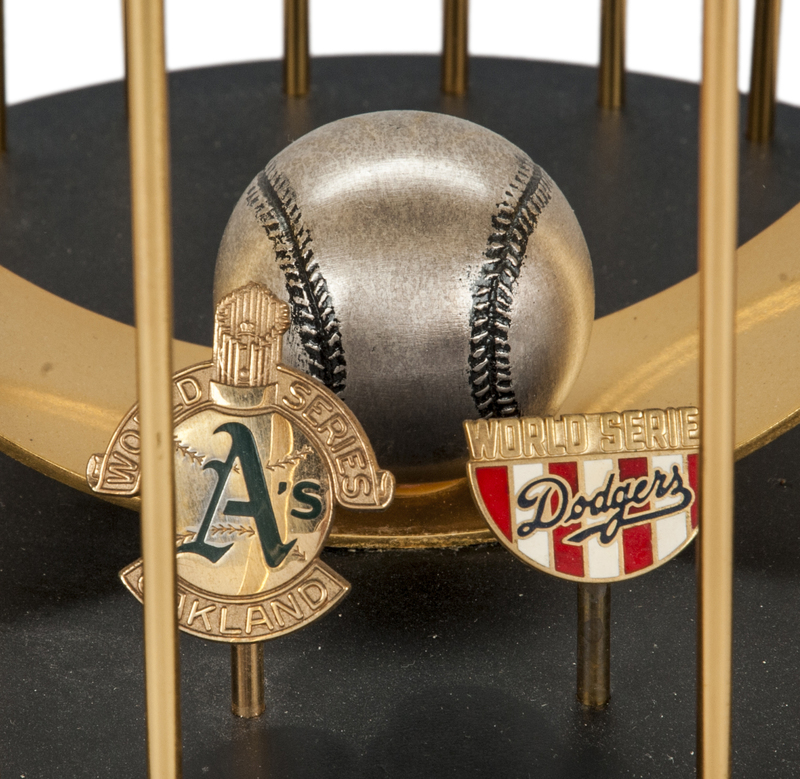 Oakland A’s and Los Angeles Dodgers press pins are mounted on smaller golden flag poles in front of the crowned band. 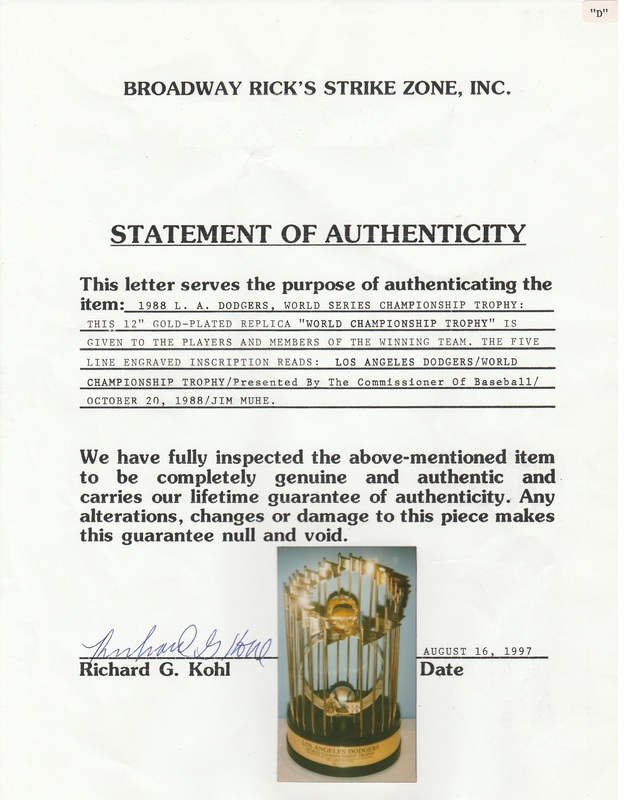 “Los Angeles Dodgers World Championship Trophy Presented by The Commissioner of Baseball October 20, 1988” is printed on a gold band circling the 23” diameter black wooden base; comes with Broadway Rick’s Strike Zone LOA.